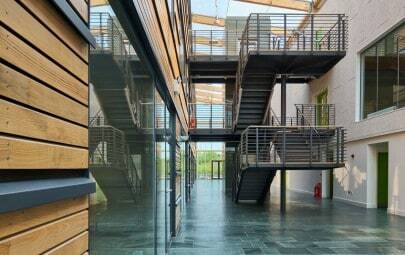 North Lanarkshire Council approached Architen Landrell to supply a tender for the regeneration of Greenhill Drumpark School in Glasgow. The council embarked on an ambitious capital expenditure program to deliver a number of new and refurbished secondary, primary, early education, additional support needs and community facilities throughout the region over a four year period. One of the aims of this particular project was to facilitate the transformation of the existing buildings into a light and airy usable space with a stunning exterior appearance, and ETFE foil cushions seemed the obvious choice as roofing material. 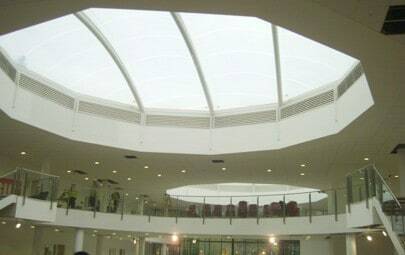 The project entailed providing a multiple steel trusses supported on a series of steel columns, the ETFE cushion roof system, associated pipework and air handling unit (used to inflate the cushions). 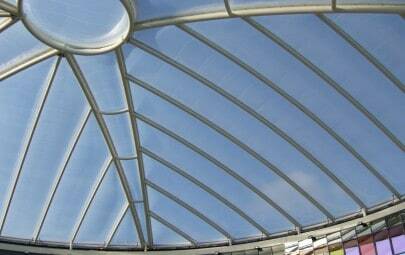 Six of the twenty ETFE cushions were designed to open for smoke and ventilation purposes using electronically controlled actuators wired into the building management system. 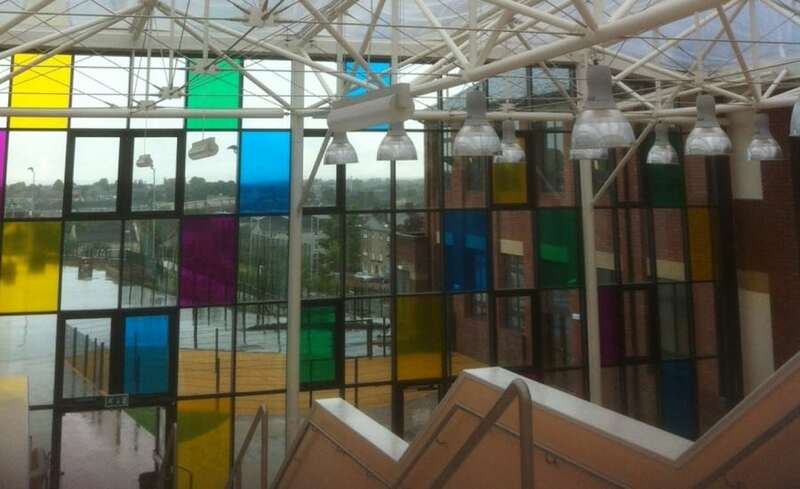 The 600 sq/m ETFE roof covers a courtyard, formed from three existing surrounding brick walls of the old school and a new coloured, glazed facade to enclose the dining area and sports area. The ETFE roof is not structurally connected to the perimeter walls but cantilevers from the columns and overhangs the perimeter structure on one side. Throughout the project weather proved a particular challenge due to the extreme winter conditions including heavy snow and high winds. 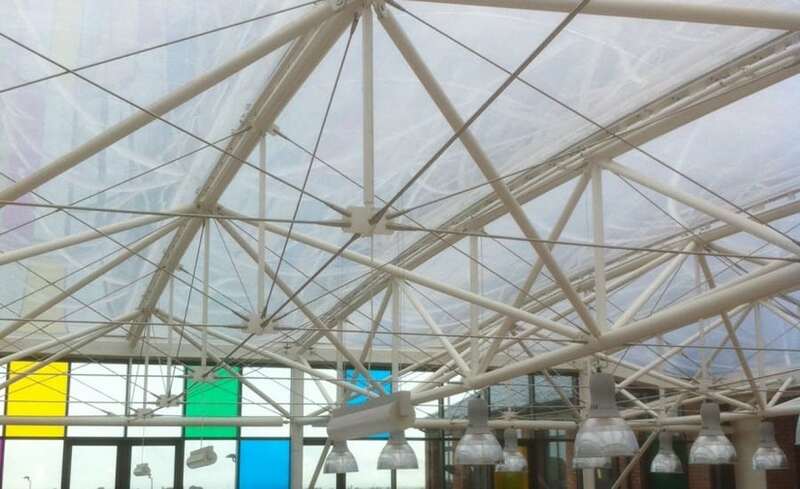 However, despite the Scottish weather, the ETFE roof was installed by expert rope access and installation personnel to ensure safety as well as the integrity of the ETFE structure. 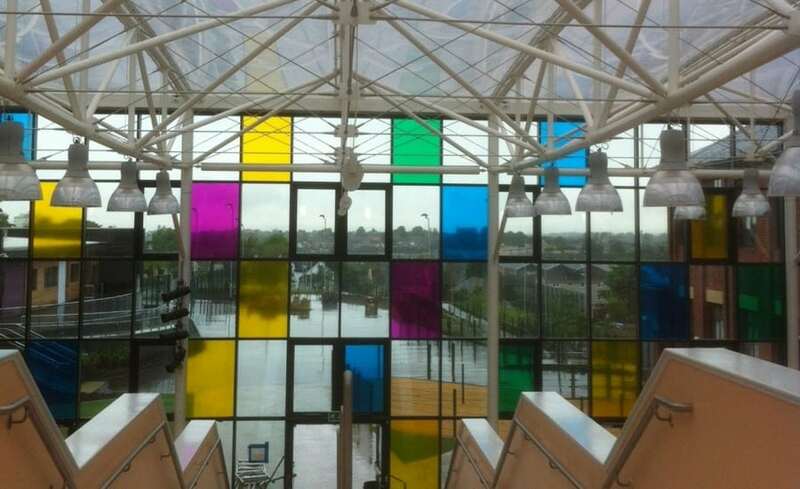 Architects CRGP Architects and Surveyors describe the ETFE cushion roof as a jewel in the school estate and we are thrilled to have been involved in such a challenging but rewarding project.